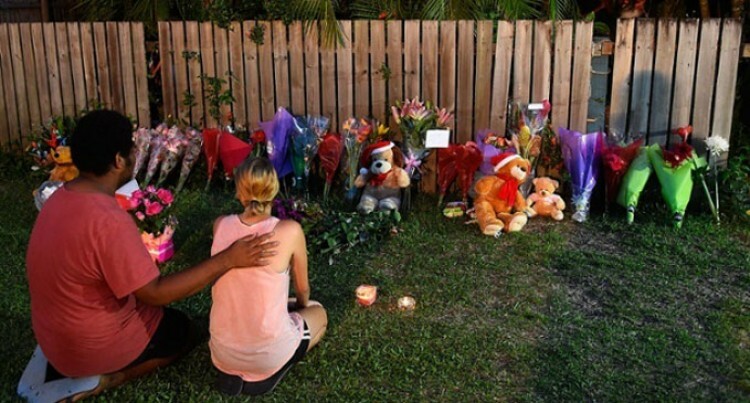 There were emotional scenes in Cairns yesterday as family members attended a memorial near the home where eight children were killed last Friday. A large group of men and women, many sobbing and wailing, walked down Murray Street in the suburb of Manoora toward the makeshift shrine created by local residents. Family members placed flowers at the memorial and consoled each other. A large team of detectives would return to the scene of one of the worst murder cases in Australia. Two days after eight children were killed in a Cairns home, Queensland police are still trying to figure out how and why it happened. Investigators believe the lives of four girls and four boys, aged between two and 14, were taken sometime between last Thursday and Friday morning. Detective Inspector Bruno Asnicar said the 37-year-old mother of all, but one of the children, was being treated for self-inflicted knife wounds and investigators would remain at the home for several more days. He said Mersane Warria had now been formally interviewed, but not yet charged, although he expected that to happen later. “We’ve achieved a lot overnight, we’re very happy with how it’s going and I would expect that we’re probably not too far-off getting to that point (laying charges),” he told reporters. He said evidence was still being gathered and up to 100 people had been interviewed by Police. He said autopsies were being carried out to determine the exact cause of death of each of the children. “The pathologist is conducting autopsies now and results of those will be brought forward in the next couple of days,” he said.